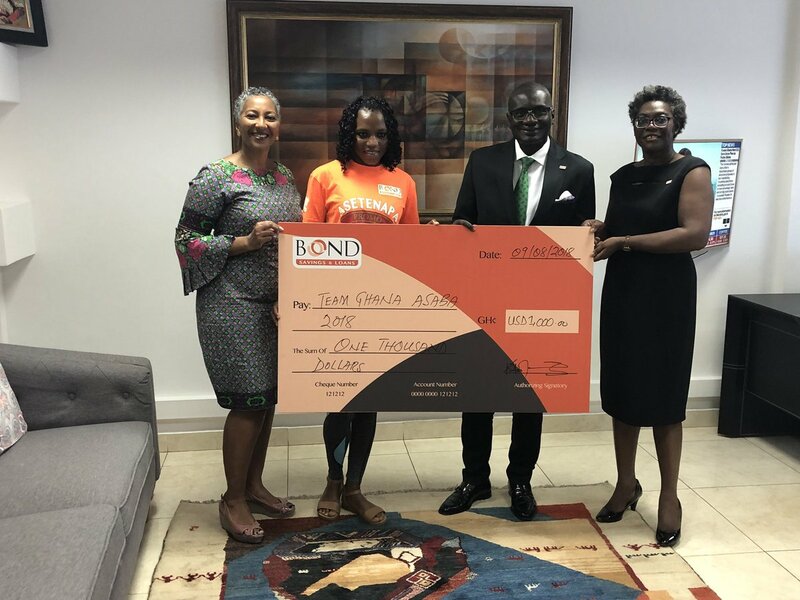 Bonds Savings and Loans Limited has donated an amount of $1000 to the four athletes who competed for Ghana at the just ended African Athletics Championships in Asaba, Nigeria. Sprinter, Hor Halutie, received the cheque on behalf of her fellow athletes who could not be physically present. Team Ghana won two medals at the African athletics biennial event; a silver in the 100m and bronze in the 200m, both won by Janet Amponsah. Hor made the final in both events but missed out on a medal. High jumper Abigail Kwarteng finished 4th while sprinter Emmanuel Yeboah reached the semi finals of the men’s 100m event. The Chief Executive Officer of Bonds Savings and Loans, George Ofosuhene and Corporate Affairs manager Shirley Longdon. The company has been a consistent supporter of Ghana athletics, as they are also sponsors of the GAA’s national athletics circuits. The athletes competed at the championships without promise of per diems or bonuses, with the GAA having to fund the trips of the four athletes with no financial support from government.